The gardening has finally slowed down. A little. A couple of weeks ago I overdid the weeding and ended up with a painful back. I knew better, too, which is the sad part. But thankfully, it lasted only a few days. Learned my lesson — I hope. After hiring a wonderful helper for a day, I’ve finally gotten things ship shape for now, so that I don’t have to be out there for as many hours a week. The weeding will always be there, but now that the temps are climbing, I tend to just toss on more mulch and run back inside. All that effort will be worthwhile when the tomatoes start to ripen. In the meantime, I’ve earned some days in the studio, which makes me happy. 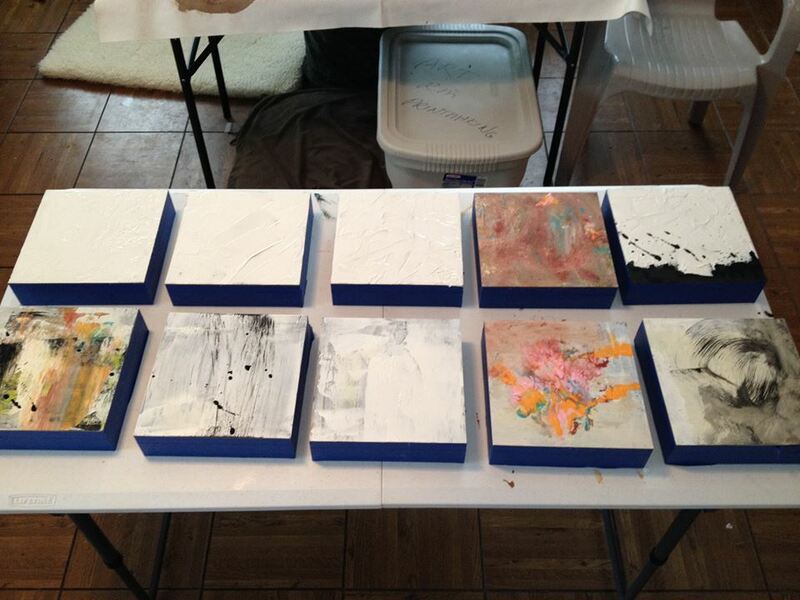 I’ve started on ten new 8×8-inch panels. Here’s a peek. Which always inspires me to make more collages. 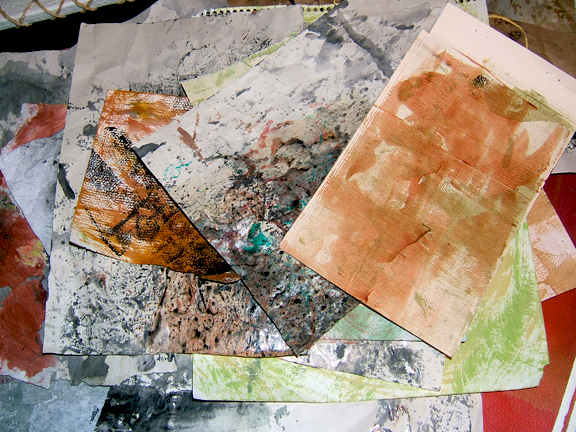 Like the new pieces….nice to have some in process. Good to get your Blog – it is always inspiring. Thanks, Shirley. I so appreciate your being there. Hi Martha: Nice to see you posting art again. MIssed you. Think I only look at 4 sites, yours being one. I do enjoy Seths site..Have now taken 5 classes from him. But always enjoyed yours. Glad garden a bit easier now, & you have started new art. Pat, that is an honor, knowing my blog is one of a handful that you read. I enjoy Seth’s site and blog too. He always inspires me. Ouch on the back! I’m a fledgling getting back to art – mostly collage/mixed media – after years as a writer – still writing, but making the shift more every day. Love your work and your messages. Great idea about the papers. Thanks for ideas! Thank you, ggmissm. I wish you many more great ideas and inspirations. Martha, your paint residue papers on top of another look interesting when I zoomed in and they were framed within the screen view. A nice abstract quality! Your new panels are beautiful, I especially love the black and whites and gray mixes. As painters we can all be thankful the gardening grunt work is over for the most part. Time for more creativity, thanks for sharing. Thanks, Anonymous. So glad you enjoyed the panels. They will no doubt go through several changes before they’re finished. I am partial to the black, white, and gray as well. Doing more of that these days. I love the rhythm that the seasons bring. It’s always good to get back into the studio when we’ve been deprived for a little while, with gardening chores and other distractions.